Do you reckon you know your Blackburn pubs? Then where was this one and what was it called? The name is above the door, but difficult to read. 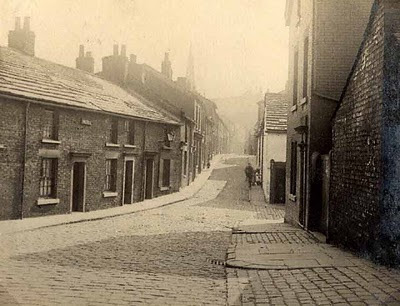 Possibly one of the oldest streets in Blackburn when this photo was taken (look at the properties facing and beyond the pub) and everything in view has long since gone, but I'm sure you can still stand, more or less, on the spot where the photographer stood. In fact, you'll probably be stood on the same cobbles, because where he/she stood, has never been resurfaced (well hadn't been the last time I walked over them). The pub was probably built mid - late 1800's, but the cottages were much earlier, probably c1800. I'm not sure when this photo was taken, but it looks like it could have been the 1950's or even the 1960's. It's not on the outskirts of town or anything, it's pretty central. Maybe less than a mile from the Cathedral, but in which direction? I'll tell you the pub name and location in a week or two. Heck Richard, I didn't expect anyone to get it that quickly. You have better eyes than me. You're right it is. That area has changed a lot since that photo was taken, but you can still stand where the photographer probably stood. If you walk down New Park Street from Preston New Rd, there's a gap in the houses, just after where The Samaritans headquarters are and I reckon that is where the photo was taken from. If you stand on those cobbles today, looking in the same direction, there's a small car-park, then a fenced 'games' court and by my calculations (using old maps, directories, other old photos etc), St Georges Hotel stood approximately where the small car-park is. If you look at some of the other photos on the blog, St George's Church stood on the corner of New Park St and Preston N. Rd, hence the pub's name. Well done sir! Wow, I'm surprised it is that one. I had no idea where Winter St was though and it's doubly surprising as I've lived around Denville Road/Hope St most of my life. I'm having a good look over these two again to figure out where things are! Hi Richard - If you know the area, then the photographer taking the second photo, looking towards St Georges Church, would have been stood (approximately) where the little fruit & veg shop is at the bottom of Hope Street. Winter Street was really just a continuation of Hope Street, in a sense. The tall building on the right also looks like a pub. Any ideas? I thought the tall building might have been a pub too, with it being on the corner, but when I checked my trade directories (1894, 1925 and 1951), the end property on the side with the odd numbers (which that would be) was a just a residence. Also on the 1929 Ordnance Survey map, all the pubs are marked PH. That particular property isn't, so pretty sure, it was just a large house. If Hope St and Denville Rd are still in the same positions as the second photo then I'm guessing the houses on the left were cleared to make way for the current houses still there, and the ones on the right went in the 70s/80s when the maisonettes went up at the back of the college. The old terraced houses thar are still down one side of Hope St aren't in the photo, they would have been behind the photographer, but yes, both Hope St/Winter and Denville Street/Snig Brook follow more or less the same lines they always have done. Denville Street took a swerve to the left, about midway down (approximately where B.C.Way is) and came out onto St Paul's Street, facing the eastern corner of St Paul's Graveyard. It kind of tapered in to meet the bottom of New Park st, which also came out there. In lived on Denville St as a young boy from 1958ish. I had my first half of bitter in the St George pub at the age of c10. We all clubbed together, about 5 of us, to share it. Tenpence halfpenny. Then the mother of one of us came in and we all tried to hide under the table. The landlord's son was with us and that is how we got served. I also remember jumping on the backs of lorrys going up Winter Street and then jumping off before it got onto New Park Street. It's a wonder we didn't kill ourselves. melville st,st pauls st, nab lane. Sheila I went to St Pauls school 1950 to 1958 , when did you ? We lived in Winter St ? Hi Sheila, I also went to St Pauls from 1948 - 1955, my grandparents lived on Alma Street. I delivered papers and was delivering at the time of the Brewery Street murder. What year were you at St. Pauls? Thanks for that Sheila. Would you know when St Paul's School closed and when it was eventually demolished? I left St. Paul's schools in about 1965 so it was still there then. Mr Sharples was the headmaster. Mr Haworth Mrs Miller, Miss Nutter, Mrs Hamill Miss Prince, Mr Hitchen, were the other teachers I can remember. I enjoyed going to St.Pauls and came top of the class when I left. (big fish in a small pond). I lived on Denville St and then on Hope St. I was also a paper boy but my round centred on Johnstone St. It was Dennison's paper shop I remember opposite St Pauls school. The grocer's shop on Hope St was Whittaker's. Other shops were Roocrofts and Gwen's on the corners of Joseph St and Nightingale St. Not very interesting to those who didn't live there but it's strange how shop names and street names come back when the memory banks are stimulated. Oh and there was Baxendale's ....I'll stop there. Thanks for that Alan. Those sort of memories are always welcome. I was looking at a load of photos of the Blackburn carnival's on the Olive Green & Ivory site yesterday evening (link on the right) and trying to determine the year of most of the photos (we think they're from a couple of different years) and a couple of them are looking down Blakey Moor towards Duke St and you can see St Paul's School in them. We think the later carnival photos are from 1965 / 1966. The picture looking up to Winter Street was taken outside the house where my friend lived, number 28 Hope St if I remember correctly, odd numbers on the left and even numbers on the right. The tall house was always residential as long as I remember it but that is only from 1960ish. Don't be misled by what looks like a road going off to the right at the extreme bottom right of the photo. This was an entrance to a small wharehouse. I was once told that Nab End in the book "The Road to Nab End" was really Winter St but lots of people thought it was referring to Nab Lane because of the "Nab". However, I bet there are hundreds of streets that someone has claimed are the real "Nab End". What I liked about the streets around that area was all the back alleys and ginnels, great for playing hide and seek. I had an advantage because I could nip into my house, my Gran's house next door or my aunty's house in Nightingale St just around the corner. I loved watching them look for me through the window. The houses on Winter St were knocked down well before the 70s although I think the St George pub may have been left up for some time afterwards. The 'spareland' was our football ground, tennis court, bonfire site etc for many years before any building work was started. In fact, when we were told they were going to build on land, one of our 'gang' went to the Evening Telegraph and complained we would have nowhere to play. I think they published an article in the paper. I lived at 17 Winter St............before the kitchen ceiling fell in, then relocated to council house in Whitebirk .The house in Winter St had several tenants , we had two rooms mum, dad and 4 kids.....outside loo, shared wash house outside...had some fun with that mangle. I agree Alan. I get a bit irritated when people are insistent that the author was talking about Nab Lane, just because it has the word Nab in the title. I have the original version of that book, it was originally titled 'Billy Boy - The Story of a Lancashire Weaver's Son'. I think the publishers changed the title when it began to take off. For a short while, a few years before he died, I had e-mail contact with William Woodruff (via his wife, as he was quite elderly by then) and that was one question I never thought to ask him (about the Nab bit of the title). A question more than a comment? On the picture of the "St Georges Hotel" in Winter St it shows a street sign in the top left of the photo. Difficult to read I know but I see "Mayson St" possibly? That would change the scenario completely. I await replies with interest. Mayson St is off Lower Audley St.
We had this question arise once before (on Facebook, I think) and after a lot of squinting, we came to the conclusion that it says Raynor St. I've just double checked again, as it's 18 months or so since we were discussing it on Facebook and in a little street directory I have, it gives Raynor St as being ''Raynor St, Winter St, Pauls'' (ie Raynor St, off Winter St, St Pauls Ward). I probably have the same directory(1960) and it is indeed as you say. Some of the John Eddleston photos I'm slowly uploading were taken in the Bank Top, Whalley Banks and King St area. So watch out for those in the coming weeks. I am trying to trace a past resident of Winter Street, Blackburn, a Dorothy Pepper, do any of your readers know or knew this lady, I believe she joined the WRAC and was posted to Wiltshire, do you know where she is now. her name if married or anything helpful. I am trying to trace a lady who came from Winter Street, Blackburn called Dorothy pepper, does any of your readers know or knew her or her family, I believe she joined the WRAC in 1951 and went to Wiltshire, do you know where she is now, or what she is now called. I have a trade directory from 1951 and just had a look on Winter St for that year Phil, but can't find a resident by that name at any of the houses listed. Hopefully someone visiting this post in the future might be able to help you. I wasn't born until 1958 and didn't really know that part of town until I was about 17, so I'm no help to you, sorry. Hi Colin, I believe she used to live at 10 or 12 Winter Street does your directory show anything for those addresses. I'm just on my way out. I'll have a look this evening or tomorrow sometime. I've just had a look, but there's no-one by that name anywhere on Winter St in the 1951 directory. At No 10 there's a Mr A Parkinson and at No 12 there's a Mr G Johnson. Have you any other Blackburn addresses for her or her family? A distant relative of mine was once the licensee of the Shoulder of Mutton on Snig Brook (around 1900)- is that very near to where this photo was taken. Anyone shed any light on her she was called Alice Ann Dransfield (nee Walton) but altogether had 3 husbands called Chew, Dransfield and Halliwell. Yes is the answer to your question. Snig Brook is the name of a little stream that runs down from Corporation Park and passes through (underground) this vicinity. It was also the name of the area, just a few streets from what I can gather. But it was also the former name of Denville St. I'm unsure of exactly when the name change occurred, but probably sometime in the 1920's or 1930's. In directories of Blackburn up to the mid 1920's, the Shoulder of Mutton is listed as being at 26 Snig Brook, but then in later directories, it's 26 Denville St. It's all well before my time, as I think the pub disappeared in the 1950's. In fact the majority of those streets are long gone. Some of the names still remain in the estate that now covers the area, but that's about all. As I mention in the text above the lower of the two photos, Denville St is that junction that is off to the right, but it was quite a long street and I'm pretty sure the pub was towards the bottom end of the street (that's the top end pictured). I went to the old Parish School ,which by the time I was there was St Peters secondary modern on Byrom St . As you came up Byrom St from King St the first on the right ( lizzies the school tuck shop was on the corner )was a street that led to Dynamo Electrics on the right was a SNIG called Bugs Alley that came out on Kings St close to the old Roxy Picture House . To your right hand side was a Flop Joint : a lodgings for down and outs or itinerant labourers in days gone by , it's name was THE HOUSE OF DUBLIN , was this ever a public house of description at any time in its history ? . Lion House corner of Addison St and Cowell St : Friendship Tavern, going down Cowell St first on right Cutler St had a pub on the corner . Mated with John ( Barny ) Barnes who lived with his Grandma a deaf lady who would shout up the stairs when I called for Barny to play out : " that big silly bugger from up Shaw St is here for you" , I have spent the all of my life trying to comply with her description ! , 69 and no change , the dye must be cast . Continued from previous letter , what was the name of this establishment ? . It obviously was a pub because we used to enter through the top windows to play in it . Continued from previous letter : first on the right on Johnston St . Sorry about the continuity of letters but a glitch keeps occurring and I cannot solve it ? . Claremont , Imperial on Devonport Road , mated with Tony Gallagher ( Gags ) , we would frequent these establishments for a light refreshment of Dr Thwates Prescription . In the IMP was a lady pianist who vamped the Ivories as well as any man who came within her company , she would always get Gags to sing Tiptoe Through the Tulips inthe same falsetto voice as TINY TIM THE AMERICAN ARTIST WHO HAD A HIT WITH IT ! . Another star turn was Dusty Bill from down Shaw St who whistled and played the spoons , when Bill was requested to give us a tern he would refuse saying he was not up to it , but when it came to shove he could always come up with a pair of Dessert Spoons ? . Claremont , Devonport Road , Arthur Bellis a former coal miner , a man of short stature and a spinal curvature that he said was caused by " a stone as big as an house dropping on him from pit roof ( ceiling of the mine ! ) . Archie Scoles the former landlord of the Greyhound in Whitehead st nicknamed him Stingray due to the way he hissed when he said anything .i would put my foot on a stool , pick Arthur up and I would be the Ventriloquist while Arthur acted as my Dummy , the place would be in uproar at this half hour or so of sheer tomfoolery , all to be lost when the Tannoys where screwed to the wall in the vault to pipe through the hits of the day and the death knell of that male domain THE PUBLIC VAULT . Johnston St , Blackburn , besides having a great array of pubs also boasted a collection of fine confectioners and three Chippies of the first order , Veritys opposite bottom of Higson St , Hayes opposite St Barnabas School , unusual in that it retained the solid fuel range ,and in between there was Jock Galloways . Jock was a scot From Kilmarnock , and in 1964 his home town football team won the Scottish championship , so we went in and said to jock that we would be entitled to a free supper to celebrate with him . Before we had completed this statement Mrs Galoway shot the idea down pronto , and said nothing would be free from her shop ! , she was the epitome of the ' careful ' scot . Confectioners or as we called them Pie Shops , Rita's near Montague St , excellent in every item made , but the speciality was the HOT CROSS BUNS which where only made for the Easter period . Another outstanding one was the one at the side of Kay's Waste Place , can think of the name of it but remember the lady who served in there a Miss Cockshoot who wore steel corckered clogs all the time and was a friend of my mothers . Next was Laura's opposite bottom of Edmundson St , they sold potato pie in a loose form and my mum would send me with a earthenware bowl and atea towel to wrap it up and keep it hot . Laura would ask how many it was for and she gave you a disc of pastry for each person , I used to tell her 8 but there was only 5 and I ate the3 extras on the way home . Lastly the two sisters who had a shop opposite St Barnabas School , they hand raised the pies and where a delight . Birchenalls Chippy/Cafe , Limbrick ::: a night of box training , indoor football , table tennis etc ,at the YMCA ( converted to THE SIR CHARLES NAPIER ) then a wander up Limbrick for chips/fish/peas/tea or coffee/bread and butter 2 shillings and 5 pence ( 22 pence today ? ) . Mrs Birchenall would take your order on entry , she stood there with her jet black dyed hair and her more than ample bust , what a joy for a red blooded teenaged boy , you were allowed 2 suppers on credit which you paid for , come Friday night . When asking for credit I would say things like " this Saturday we are going to the Mecca , would you like to come with us , all the time nodding and intimating towards her chest . With this Mr ' B would be frying your fish fresh, while at the same time would be glaring at you through the mirror on his range and probable thinking I would not get fed up of giving you a good hiding . He was a person of few words, come to think of it , I don't think I ever heard him speak !. He had his hair Brylcreemed with a centre parting and we used to ask him questions like " do you get that hair style by dipping your head in the chip fat " . Happy nights for me and many others , belated thanks Mr and Mrs B and your patient staff for our Testosterone fuelled overexhuberence , BLESS. 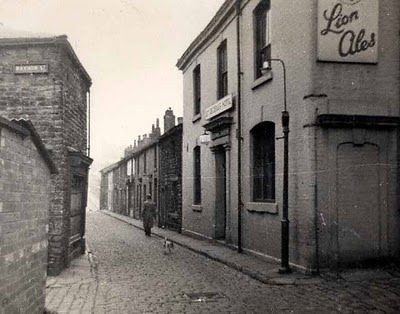 Sharplles Bros , joiners , bottom of Little Shaw Street off Johnston St , Blackburn : every one who had rabbits or poultry used to go and ask Jack or Albert for sawdust and shavings . Jack lived in the top part of Shaw St , above Johnston St and called Big Shaw St by the local residents , he lived opposite from us in a house that was obviously owned as a tied house by Thwaites Brewery as it was adjoined to The Royal Duke on Johnnston St with a access point between the 2 properties . Peter Garrity lived in Higson St and I mated with Peter at St Barnabases and St Peters also in our teens , his. father Jack was a slaughterman by trade and kept poultry and a cockerel in the backyard , selling eggs to the neighbours . He used to allow the birds to wander up and down the back eating the grass and helping themselves to the earthworms , wood lice and anything else that was part of the Backstreet Eco System . His grandfather Ginty had the allotment at the rear of St Paul's Working Men's Club in Montague St and grew some outstanding vegetables . A world apart , and yet only some 55 years ago , what would the P. C .movement have made of this situation ? . My letter from 6 / 6 / 15 as regards derelict pub on corner of Cowell St and Cutler St , Blackburn : I have remembered that we called it " FLETCHERS " , it was definitely a former public house because it had the swivel pulley bracket mounted on the outside wall in Cutler St and a cellar access situated in the footpath below it ! . To the rear of the building was a ' SPARE GROUND NAMED KAY'S BACK ' which had a12 foot wall , the ' SCUTTLE WALL' named so because in the yard at the other side , years previously had been the site of a SHUTTLE MANUFACTURERS ' . To pass the trial by ordeal to become a member of the Kay' s Back Gang you had to climb the wall , stand up and jump off into the grass which had been littered with broken bricks etc ! . Easier to get in the S. A. S.
Continued :::: I had a order bike with steel frame and large basket for transporting the groceries . 10 shillings a week for delivering newspapers morning and night 6 days a week , Mon, Tue , Wed , Fri night and Sat morning 12 shillings and six pence delivering groceries . I delivered to hotels on Preston New Road and was asked to nip into town to pay this or that for the proprietors , half crown tip here and there , it soon mounted up £ 3.00 some weeks . Unfortunately time ran out and it was time to leave school ! , old railway goods yard ( opposite Waterfall Mill gates , apprentice to Jim Ansbro of the Waterfall joinery Co , 40 hard hours a week , take home pay £2. 14shillings , work Saturday morning total £3. 1shilling , OH HAPPY DAYS . I had to be there at 8 and leave at 12 every Sat morning because Tom and Bill Dewhurst ran the moulding shop next door and I was never sure if they would have blown the whistle on me being late or leaving early ? . The moulding shop , black sand , molten metal , smell of burnt metal from the grinding , it was its own little hell on earth , yet I helped A long term friend of mine get his apprenticeship there , forgive me Brian ( Clark ) for we knew not what we did . I played Table Tennis at St Barnabases youth club and later at the YMCA in Limbrick ( later to be converted to The Sir Charles Napier ) and later still the New Y M C A on Clarence St , the episodes and occurrences in this period of time still is an amusement to me .One character that comes to mind is Frank Thomas , Scouser , who came to Blackburn to live with his sister in Grindleton Road , not far from where I was living at my mums on Johnston St . One particular night we are just finishing playing ping pong and I say to Frank I'll set up a couple of brews of coffee before they close up , Frank comes ambling down the stairs , hold all in hand , two tone grey mohair overcoat that makes him resemble a ageing Yeti ! , he is making his way to the door , so I remind him that there are two cups of steaming Arabica Beans for us , all to no avail , it's obvious Frank as got the Thomas on and his notorious mood swing is going like a pendulum ! . I grab hold of my bag and set off after him he is moving double quick time , resembling a rhino doing a impersonation of that walk of W. C Fields , this for a person who is naturally a ambler . I catch up with him and remind him of the coffee and that I had shouted of him on his way out , he muttered something about shrapnel impairing his hearing . Remembering his contrariness I fancied a pint , so I suggested we call and pick up a bag of chips , my ploy worked , and he said we will call in at that shite hole on Devonport Road , the Claremont . I ordered 2 pints of Doctor Daniels Prescription , the Golden Elixior Bitter Beer , Frank on his first mouthful enquires of me , this is like camel piss and do they retain a zoological garden in the cellar ? , I said mine is fine , and suggested that he took it up with Fred the landlord who kept a superb bitter beer and also a very handy weekend barmaid . Frank drank it and ordered another two pints for us saying it as improved on the last time we were in ! . Last orders two more pints and he necks his and says to Fred , it is good to see your making an effort , placing the drained glass on the bar top .and it's good night from me and likewise from him . Just switched on my I Pad , and up came the image of the George on Winter St , and up popped the name of the landlord who I could not recall his surname in a previous letter , John Morris who son was known as Johnny . Funny how the clouds clear now and then to allow you to see or should I say recall something that was a complete mystery only days before , should this be attributed to me being nearer to 70 ( 12 months away come Aug 29th ! ) or due to imbibing bitter beer from the LION BREWERY AND DANNY T s for many decades ? . FURSTY FERRET is now my limited tipple up here in Scotland , Land of Lager ( nearest thing to Wee Wee apart from Piss ) , limited intake due to being on medication , like the old saying goes " things may come and things may go , but the art school dance goes on forever " , the N H S is my saviour now. How best would I go about discovering the name of the pub on corner of Cowell St and Cutler St in Blackburn ? ? ? . Another poser is that one of the streets off Leyland St , Blackburn , had a Brewery with a huge red brick edifice , VICTORIA was the name that comes to mind , and it was demolished in the very late 50s as part of the clearance of the area that took a great many pubs also .Maybe entirely wrong here but when I made my way to St Peters School from my home in Shaw St ( 1957 to 1960 ) I think it was a launderers ( Haydocks ) ? . Anyway getting back to the Vitoria , when was it in operation brewing and did it have tied houses like the later Blackburn brewers ? . I would appreciate feed back through these channels : PLEASE PLEASE PLEASE of any known pubs it owned , why it ceased trading etc. Sorry David, I have no information as to whether the Victoria Brewey had tied houses. A brewery was established on the site in 1868 and was bought a few years later (1874) by a local school teacher, Thomas Whewell who introduced the brewing system. It was brewing beer until 1925, when it was bought out by Nuttall's Lion Brewery at Little Harwood. I have uploaded one of John Eddleston's photos of the brewery tower as it looked just prior to demolition. His photos are believed to be from 1962/3. As for the pub you want to know the name of, there is a little book called 'Blackburn's Old Inns' by George C. Miller which has a comprehensive list of 495 licensed premises in its back pages, as they were in 1893. The book is probably available on the internet (eBay or Amazon). If you decide to buy a copy, ensure it is the later edition with the green covers, as the earlier edition (pink covers) doesn't have the list of pubs in the back. Looking at the list, the pub you want the name of was possibly the Friendship Tavern, the Great Eastern or Whitehead's Arms. They are the only three listed as being on Cowell St.
All well before my time. Thanks Blackburnlad , I got the list of the almost 500 (FIVE HUNDRED ) Blackburn pubs from my I Pad and the Friendship Tavern and the Great Eastern are obviously the same establishment and postal address : 1 , Cowell Street , The Whiteheads Arms , even numbered , so this is the one at the corner of streets Cowell and Cutler . In my previous letter I mentioned that we refered to it as FLETCHERS , I was mulling over the name and that was for a premises across the other side of the street with a huge double door access ! , must have been related to the mill industry in its time ? . St name ? ) would prove to be some crawl , which would have taken me some time due to my preference for quality as opposed to volume . Blackburnlad , I refer back to my letter 6th of June , THE HOUSE OF DUBLIN in Chapel St , first on right , on Byrom St , coming from King St , did you manage to excavate any info about this establishment ???? . I am 68 and went to St Peters Sec Mod ( 1957 to 1960 ) and it was open to use during this period ! . I recall anecdotes from various sources over the years relating to things they had been told about the House of Dublin and it was obvious common knowledge among the older end to me that certain practices were to say the least to me UNUSUAL , they had a levy of charges for the facilities on offer , beds, then straw mattress on the ground right down to what was referred toas THE PENNY LEAN , this apparently consisted of a guy rope secured at both ends , whereby the clientele of this mode of lodgings paid a penny for the service of being able to lean on the rope in a standing position and sleep thus . I heard it said many atime in the building trade that such abody could SLEEP ON A CLOTHES LINE , I wonder if that saying is a result of this practice at The House of Dublin and also another FLOP SHOP that was in the St Albans Church area ? . The original Bathesda Chapel ! , was it situated on Harrison St , where Edward Jones Builders Merchants stood , opposite the end of Canterbury St ?. The reason I raise this query is due to looking up Chapel St I noticed the Bathesda Chapel out towards Hankock St , and it brought back memories of the boys club that was run from their of an evening . Tom Cox , the father of Tom and Terry who I went to St Barnabases with , was in charge and he used to teach the attendees Boxing , of which I remember very well and Tom being well taught by his father always gave us a lesson in the finer arts of the sport ! , and of course there was BIG Joe Varey Pumping Iron , we used to try the weights for the fun of it , but if you did not lift them evenly they where inclined to fall off at one end due to there only being one securing nut instead of two . I haven't been digging for anything about the House of Dublin to be honest David. I've been too busy. I'm 57, so a lot of these places are before my time. From what you've said above, I'm assuming it was a lodging house of some description. I do know that the very first Catholic place of worship was on Chapel Street, established sometime in the mid 1700's. Until then, local Catholics had worshipped in the houses of the local gentry (some of who were Catholics). When St Alban's (the first church, smaller than the present one) was built, the place on Chapel St would have become surplus to requirements, I would think. Maybe that became the House of Dublin ? I'm not entirely sure just where on Chapel St the Catholic place of worship was situated, so this is just conjecture. If you go online onto a site called MARIO (Maps and Related Info Online), which is run by Lancashire County Council, they have maps from the 1840's and from 1910 that you can look at and zoom in on particular areas (well any area), you may find your answers with regards the Bethesda Chapel etc on there. Your observation about 'sleeping on a clothes line' could very well be right. I'm sure there were lodging houses in many areas of Blackburn during the 19th century (and both before and after). There were certainly ones on King St and there were definitely ones on Lark Hill St (just off Lark Hill). Continuation : bible lessons , then beans on toast , Bent St , Ragged School , teaching of the scriptures , hot drink and a biscuit , plus you had to put so many appearances in to get the Xmas party invite , which included a pressy or two ! , If I had known that the Sikhs had a temple somewhere , the turban would have been on and it would have been bring on the Curry and Nan ! . on purchase or consumption ? , licensing laws as regards all of the modes . The films that where discovered in the cellar of the shop on Darwen St , showed these vendors of ale outside of places of work , otherwise I would have been none the wiser as regards this practice ! . I look forward to a reply in your own time as my curiosity has been aroused more about old Blackburn due to writing these letters and reading the various other contributions . I would like to know if it is possible to purchase the DVD OF THE BLACKBURN SECTIONS OF THESE FILMS ???? . If you can find the time, a search on the internet will provide you with the answers re the history of the licensing laws, far better than I could. They will have changed quite a few times over the last 200 years or so. When water wasn't as freely available to us via our kitchen sinks as it has been for the last century or more, people drank beer / ale because it was safer than the often contaminated water they had to hand. I'm certain it was given to children as well. I can believe that beer was probably available from hand carts outside mills and factories at some point in our history, but what the legalities of it were, I wouldn't have a clue (sorry). I do know that similar vendors stood on the streets in the 1800's, selling the likes of ginger beer, sarsaparilla, mineral waters of one sort and another, so it's quite feasible that some also sold beer as well. The films that were discovered (Northgate it was, not Darwen St) are the Mitchell & Kenyon reels. I don't think there is a DVD or video that shows just the Blackburn clips, but I think the majority of them are available to view on Youtube and the British Film Institute website. From my previous letters you will have noticed that besides the delights of LION BITTER AND DR THWAITES GOLDEN PRESCRIPTION , I also have a appetite for the PRE INDIAN / CHINESE fast foods of bygone days . Freckleton St Public Baths ,exit after a Saturday Morning of great mirth and enjoyment , turn right towards Canterbury St , small confectioners on right , go to rear of shop , you could buy a 1 lb loaf that was misshapen for a old 1penny , eat out the contents and go across the road to the chippy and ask them to fill the loaf with chips , this takeaway would last all the way up Montague St and onto Johnston St , mum had no need to make a dinner for me oon arrival home ! . If you came out the baths and made your way home , on the right hand side opposite the Gas Clubwas a confectioners who sold the very small penny loaves ( Brown bread ). Not Hovis but TUOROG ( could have the spelling wrong ) and on the outside wall at 2nd floor level was the name of this bread in huge brass letters , Munich this till we reached Johnston st and then call in at Veritys chippy for a bagful of sustainance .Another alternative was to call in at the pie shop on King St , oppositet the end of Byrom St , spud pie and a large custard if they were any left always cheaper at this time because they did not want them left on there hands over the weekend ! , 10 old penny's for one of the biggest spuddies in Blackburn , the honour for the biggest custard must go to either Bells , just opposite the Griffin or the one with the rounded windows at the end of Whalley Range , I have put a stone on just writing about our English Take Aways ! . Hollands much preferred to a Imrans ! . I am always recommending HOLLANDS Spuddies , Cheese and Onion , Steak PUDS and Pies to the people up here in Scotland where I now live . I have been here for some14 years plus and when I got myself settled decided to go and watch my local football team which was ALBION ROVERS OF COATBRIDGE . I was fascinated to watch the antics of the fellow supporters with what they called SCOTCH PIES ( Highly Seasoned Minced Mutton In a pastry ) , they would break off a piece of the pastry and pour the gravy onto the terracing , within a couple of minutes this had set on the concrete like a ivory coloured disc of lardy fat , not for me thought I ! . Another practise is that in the chip shops they drop pizzas and scotch or steak pies into the chip frying fat . The pies at the football ground are greatly improved now and are supplied by a local confectioner Christies , who often win national competition for their savouries , happen as well because what small support they get would have been decimated with premature deaths due to the original supplied suicide savouries ! . Letter 28 th of June : Confectioners on Canterbury st was Deans , this also brings to mind a eatery on Whalley Banks , one DEANS CAFE . I had been playing table tennis up the then YMCA ( now known as THE SIR CHARLES NAPIER ) with Alan Whittle (Whitty) , he suggested giving Birchenalls Chippy in Limbrick a swerve for this evening in favour of Deans Cafe , ok thought I , we wil go along with that and off we went . On arrival I was not sure if it was opened or not , but reaching the door I could see the forms of people sat at tables dining , on entry I was quietly amazed at the dining area which consisted of the 2 front rooms of the shop premises , but only illuminated with a single 60 watt bulb without a lampshade . Having sat at a convenient table Alan was greeted with the ' maitre dor ' , obviously because he was a previous patron he received a welcome and a smile , I was treat as though I was a non entity , he returns with cutlery all stainless steel knife, fork and spoon for Whitty , while mine consisted of blackened chrome fork and spoon , with a bone handled knife ( obviously I was not to be trusted with the first choice service , perhaps because of the large hold all I was carrying with my ping pong gear in ? ) . Then the Bill of Fare a extensive menu with the following delights to offer Mince Curry , Baby Cauliflower Curry or Mixed Veg Curry. Served with 3 Chupattis , I pondered for a while and thought I don't fancy the Mince Curry in case the meat had been supplied by the BLAKEWATER BUTCHERY COMPANY : BRAZENDALES PRODUCTS wich was just to the rear at the other side of the bridge ! . Baby Cauliflower Curry was my choice , it arrived at the table some half a minute later along with huge whole meal flat breads , accompaniment was a carafe of glacial melt water from the foot of the Himalayas ( Jug of tap water , courtesy of Blackburn Water Works ) Alan was served also . On taking my first mouthful I sought the glass to fill , so as to cool my palate , them sought a napkin of some description to enable me to dry the tears from my eyes , sweat from my brow but most of all to allow myself toclear this mucouse and snot that was emanating from my nostrils by the bucketful , all to no avail , so I plunged into my hold all and took out my sweaty towel from the ping pong games and started to reclaim my senses from this suicidal overdose of Oriental Spices . Whitty enquired after my well being and I then gave the culinary delight my full respect and consumed it in a slow and measured manner with volumes of water , I enjoyed the experience so much so that I frequented on many occasions after this initial visit . On each of these other visits I sat at various tables , never to find one that was not wonky , it was similar to dining on the Titanics maiden voyage . I ought to mention the decor , the walls had received a single coat of Sulphur Yellow Emulsion onto patterned wallpaper giving the diner a Matisse Bohemian feel , floor covering a homely but well worn oil cloth , the rickety tables had 4 un matching chairs each that resembled some thing rescued from Charles ' s waste skip !. But all the same a cheap good eatery . Colin , July 1st comment , removed by blog administrator , reason why ??????? . I enclose my own E Mail Address ( david@jonathangibb.co.uk ) to enable you to elucidate more freely than on the open Chanel of this column ! . I need to know if I have to toe some invisible P C line as regards certain subjects , themes or matters ???????? . Your comments are often sent and then immediately followed up by a series of three or four unnecessary and often irrelevant, one word or one phrase post scripts and afterthoughts. Take a look at your recent history on this post, ie 'Lion' followed by 'a Lion house' 'Synagogue' etc etc. Totally unnecessary. I have no memory of why your July 1st comment wasn't published or was removed, I can only assume it was some similar unnecessary post script or afterthought and that I deemed it irrelevant to the continuity of the thread or your previous comment(s). I have no intention of e-mailing you. This is a personal blog, not a public forum and I have no wish to discuss the political correctness of any of the content of your messages. As sole administrator and moderator, I reserve the right to publish or not to publish. I welcome relevant comments, if people want to leave them, but I am under no obligation to approve/publish them. You would perhaps be better off on Facebook, that's a public forum just full of people who love to ramble on at length about their old friends, old haunts, old tales and such (time after time after time). Repetition, post scripts and afterthoughts on the threads on those forums are commonplace and as they're self moderating (to a greater degree than say on a personal blog like this), then you can add post script after post script and most people wont give a damn. You might begin to drive a handful of the other contributors up the wall, but they'll be sure to tell you if you do so. Arguments, bitching, squabbles, differences of opinions occur with great frequency on the Facebook groups. There's always someone who will spell out to you what the ''Invisible PC line as regards certain subjects, themes or matters'' as you put it, are. They'll probably contradict themselves in doing so, but that's public forums for you.